The challenges they wanted to face with this Project is to make Zone 9 an inclusive, safe, resilient and sustainable zone, where inclusive and equitable quality education are ensured. Zone 9 problems arise from several factors: immigration, precarious housing situation and difficult economic and social conditions. The resources, services and projects put in place by partners and institutions are fragmentary and cannot face properly the multidimensionality of problems; these are often temporary solutions because they relate to individual projects and not to services that produce only short-term effects. There are forms of self-organization and citizen participation but little coordinated and incentivized. The quality of the school system and the ability of schools to respond to the multiplicity of problems is affected by these problems and there is also a huge need for parents of a qualified and multidimensional support to foster the relationship between schoolfamily and territory. The project has been able to activate beneficiaries and attract people that has become active protagonist of the community expressing the concept of community welfare. A demonstration is that 82 persons offered their time as voluntaries to organize events in favor of the beneficiaries. Moreover during the Italian courses inside the centers stronger relationship among the foreign people has been built. The detected effect is the creation of mutualistic solutions based on the ethnic word of mouth born inside the project (self-organization of system of children care, summer camp, linguistic workshop held by foreign women). The activation of the local community has been also proved by the realization of some small interventions of maintenance realized into 3 local schools (Scialoia e Agazzi, Don Orione) thanks to the collaboration of volunteers coming from some companies of the 9 Zone and some parents. This has a great value because helps people to exercise its educational role and to become example of a self-educating community especially for the children attending these schools. The value of this action is bigger in consideration of the fact that in the past the same schools have been victims of vandalism acts. However an expected change that has not till yet occurred is the capacity of the Community centers to attract people not actually charged to social services. This makes us reflect on the general need of offering more attractive activities for the local people and on the need of enhance the comparison between the community centers with the best results (Comasina, Bicocca e Isola) and with the ones facing more difficulties (Affori in primis and Dergano). To reach this goal a training course for people managing the Center has been provided (from October till April) and during the next year some other events will be proposed (cocktail before dinner, laboratories for children, cinema, concerts) to open the spaces to a wider public. The created 5 territorial community centers are today a point of reference for the community of 9 Zone and have allowed to overtake the fragmentary of the social services, helping to create a permanent solution able to create a strong relationship between different associations and partners operating on the territory. This allow to provide to individuals a “complete service” that help them to act directly for their rights and inclusion into the global community. “Scuola Bottega”, a support for children to help them to reach the Middle school diploma. “Scuola Bottega Lab” a support for young people attending secondary school, to help them during the first years in order to finish in a successful way the school year. A training path called “employability” activated for NEET people, in order to reallocate them inside the school or to make them do a work experience inside some companies. 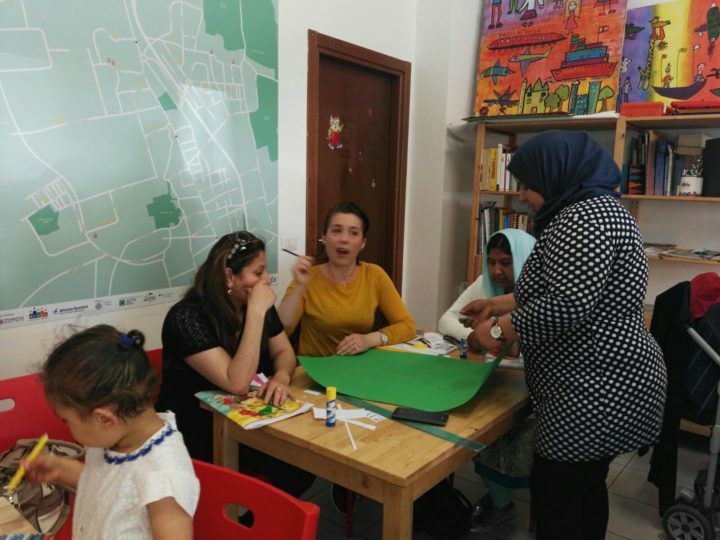 These goals has been also achieved through the offer of psyco-pedagocical consultations to the families and with the creation of a “Space for integration 9+” in the Istituti Comprensivi “Confalonieri”, “Sorelle Agazzi” e “Scialoia”. In these spaces children, parents and teachers can have information and psychological support to face the difficulties of the educational path or of the familiar relation. This allow to improve the ability of schools to respond to the multiplicity of problems and help people to activate their resources and potential to become more resilient and ensure to all social inclusion and the full exercise of their rights. The most impact of the project into the community was the creation of strong relationship with the territory and the community that become able to find inside the solution to the local problems. A sign of the progresses made in this direction is the creation of community links that have collaborate to the fund raising for the Nove+ project.